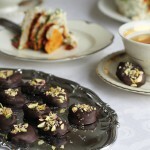 This is one of my favourite home-made candies, it’s a much healthier, gluten free, easy to make yet elegant treat. Decorate the chocolate covered apricots with whatever you fancy and you are sure to impress your guests with this easy to make treat. 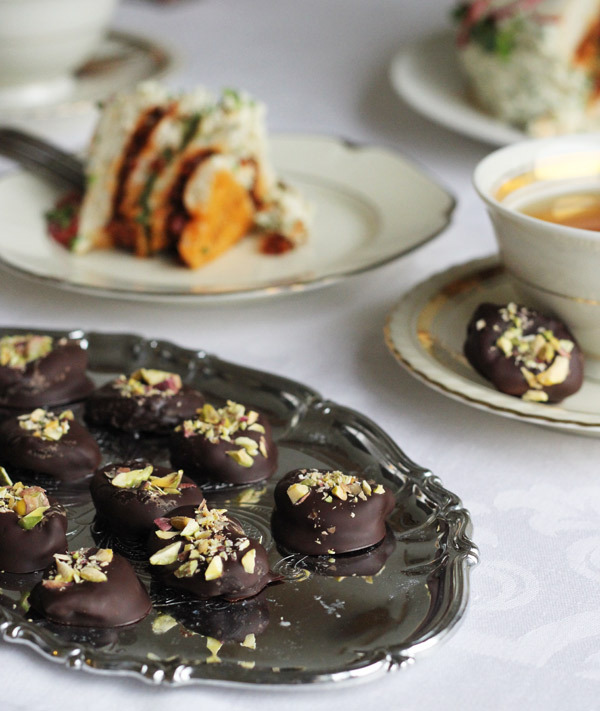 Goes perfect with a cup of tea after a dinner or on a dessert table or buffet. Prepare a large tray with a sheet of baking paper. Add a metal or ceramic pot on top of a pot with hot water. Break the chocolate in pieces and stir the chocolate with a spatula. Add the apricots and stir and ensure that the apricots are covered completely. Remove the apricots from the hot bowl with a fork. Ensure that the cavity in the apricots surface has extra chocolate in it. Then place it on the tray. Sprinkle each apricot with finely chopped pistachios. Let set and dry. The store in an airtight container.